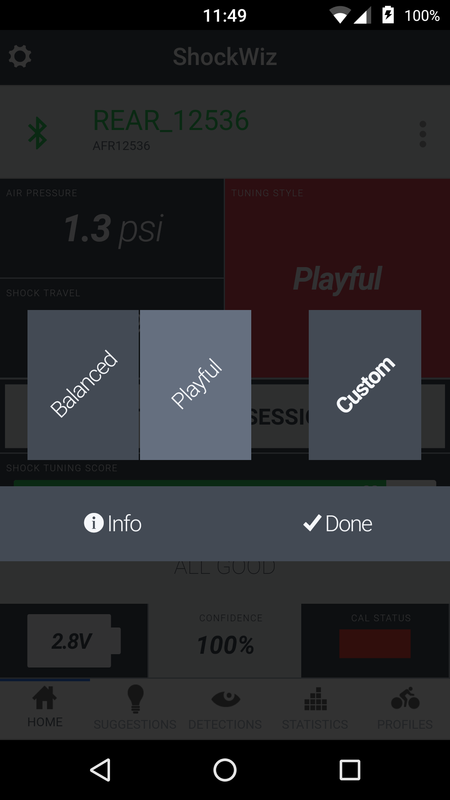 New Custom Tuning mode for ShockWiz | Rent a ShockWiz - ShockWiz Rentals! Nationwide and Bay Area! 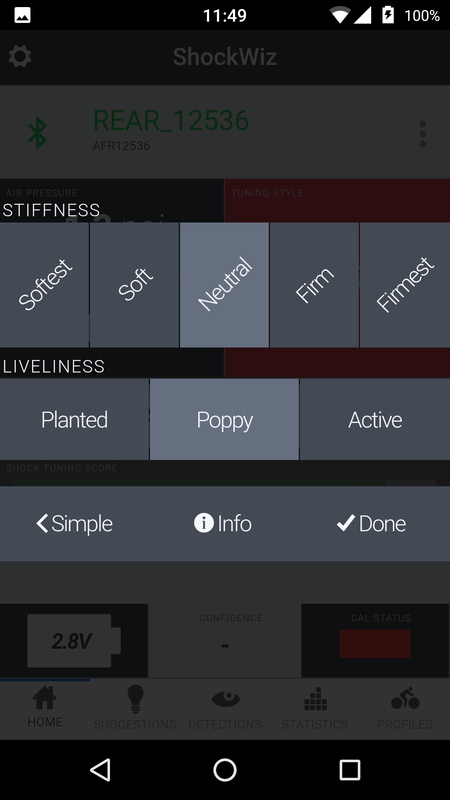 Generally, as you move from the Efficient tune towards the Agressive tune, Shockwiz would suggest a softer suspension setup resulting in more use of travel as well as increasing overall liveliness. Now, Quarq has removed the Efficient and Agressive tunes, and replaced them with a new Custom Tune mode, which allows riders to further define their preferred tuning mode based on their personal riding style and preferences. Balanced – Provides an overall compromise between traction, suppleness and pedaling efficiency. Balanced serves as a great baseline tune and is a favorite with ShockWiz users. Playful – Allows for a perfect combination of traction, suppleness, and pedaling efficiency but with a livelier feel to give the bike ‘pop’. Custom – For any rider who is not completely satisfied with Balanced or Playful tune, the Custom Tuning Style allows you to select one of fifteen different stiffness and liveliness combinations. Stiffness can be tuned with one of five choices ranging from Softest to Firmest. By tweaking the Stiffness, you can alter how much resistance to movement the suspension has. More stiffness will result in a more efficient, but less comfortable ride, which is a XC racer preference. Alternatively, a stiffer Tuning Style could be selected when you are running a bike that is designed for burlier trails (i.e. a 180 mm travel bike on mellow, flowy trails). Liveliness can be tuned with one of three choices ranging from Planted to Active. By altering the Liveliness, you can change how active the bike feels in ‘dynamic’ (through rough obstacles and on jump take offs and landings) situations.